I want to dedicate this sweater to my dog, Spotacus, for his constant companionship as I knit and his constant contribution to the amount of animal fiber included in this sweater. Can you see it? Sheesh, it looks like I tried it on and slid across the floor on my belly. Human swiffer, people. Maybe knitting two sleeves at once, while learning a new knitting style, wasn't the best idea. The awkwardness may have affected my gauge on the upper arms and it's draaaaagging on. But I console myself with the fact that when I'm done I won't have another elephantine sleeve to knit. No, all strange and saggy sleeves will be complete. They don't look weird in this photo, so I'm hopeful. The whole sweater is going to have a lot of positive ease and be a little longer than the pattern directed. It doesn't look all that loose or long in this photo, but it's bunchy, unblocked, and still on the needles. My main concern so far has been wether my ribbing will be too loose, 'cause let me tell ya, I'm not re-knitting 1x1 rib again! 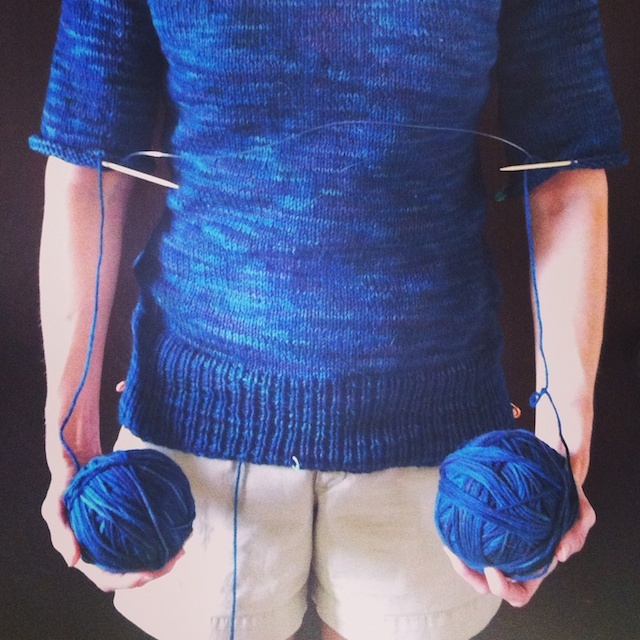 You can follow everyone else's progress in the SSKAL on ravelry or on instagram at #SSKAL14. Haha thats what happens to every sweater I knit :) so much Milo hair in there.. It looks like it will be a great sweater! I started knitting two sleeves at once yesterday and so far I'm liking it! I absolutely despise knitting 1X1 ribbing. I just today had to do 7 rows on the bottom of my currant cardigan and I must have cussed and put it down, and walked away 10 times out of shear boredom. Ugh, kill me. I was so happy when it was over. Of course next I had to pick up stitches for sleeves and that's a whole different kind of fun. Why is this my favorite hobby, lol? It's a labor of love, especially with cats. They have to wake you up exactly fifteen minutes before the alarm each morning. They must have their food bowl full at all times, and all the blinds cracked. Or is it just mine? As a teenager I had a cat that would wake me up to turn on a small stream of water from the bathtub to drink from every night. And I did it, no questions asked! Oh, me too! But I have to admit that I like the way that ribbing looks when it's done. I usually reduce my stitches a little just to make sure it's not too loose. There is nothing worse- nothing- than realizing you finished all the 1x1 ribbing and it's so loose you must do it over again!